You’ll enjoy your stay in luxurious comfort in your choice of 23, two, three & four bedrooms Little Cove luxury accommodation apartments, suites or penthouses. All are self-contained with full kitchen and laundry facilities in the apartment. The Cove Noosa’s ambience is always relaxing with the waterfront views, the sound of waves and birdsong from surrounding rainforest. 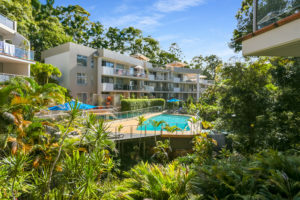 Whether you want to simply relax around the pool, indulge in Noosa’s boutique shopping, restaurants, day-spas and galleries, or get active with national park walks, surfing, paddle-boarding or river cruises, your accommodation is in the centre of everything and the perfect Little Cove accommodation choice for your ideal Noosa holiday. The Cove Noosa apartments are all contained with full kitchens and laundry facilities in each apartment. An undercover dedicated parking space is also allocated to each apartment. The resort has a heated swimming pool and a number of guest services for your conveniences. 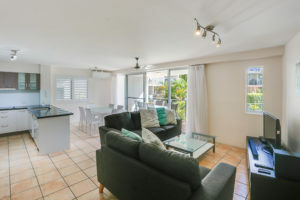 The Cove Noosa offers the best in Little Cove accommodation on Hastings Street, in Noosa Heads. © Noosa Festival of Surfing 2019 | Website by VA.